Cats always bring a piece of warmth and comfort to the house, it’s nice to talk and play with them. However, picking up a stray cat or kitten from the street, it is always worth remembering that animals are a potential source of danger to health. In addition to the fact that cats are able to inflict bites and scratches, they can still reward you with fungal skin and hair problems, some infections, one of which is toxoplasmosis. How can such pathologies manifest themselves, and how to prevent these diseases? In medicine, there is a whole group of diseases that a person can get from animals. These are zoonotic infections transmitted by biting, scratching or tactile contact, close association with animals or care for them. Cats are not exception in this respect, even though they are considered very clean beings. Viral infection of cats, with the exception of rabies, is not dangerous for people, whether it’s a small kitten or an adult animal. Therefore, even if your cat is sick with any viral pathologies, this is not a reason to part with it. However, there are a lot of other microbial and fungal infections that can be dangerous for its owners. In this case, the cat can both get sick itself, and act only as a carrier. Here it is possible to carry helminthoses (helminthic invasions), toxoplasmosis, fungal lesions of the skin and hair (ringworm), as well as lamblia, cryptospores and even salmonella. If a cat is suspected of an infection, it is necessary to consult a veterinarian to find out not only the ways of treating the animal, but also the degree of danger to its owners. One of the most common diseases that can be picked up from cats is toxoplasmosis. They are especially frightened by expectant mothers who have animals in the house. But it is worth investigating, is this infection really so dangerous that it’s better to part with a fluffy pet? Toxoplasmosis cause special protozoa, their main host is feline. May toxoplasma live in the body of intermediate hosts – rats, rabbits, sheep. Parasites enter the cat’s body with raw meat, which animals consume. Therefore, it is possible to become infected with toxoplasmosis also in contact with other species. Usually adult cats, having been infected with this infection as a child, are immune and the risk of infection from them is small. But little kittens, also picked up from the street – this is another matter. However, those people that are inveterate koshatnikami and communicate with animals from early childhood, usually by the age when they plan to have children, have immunity to toxoplasmosis. Therefore, it is dangerous in terms of infection to have a kitten (picked up from the street, and not verified by a veterinarian) if you have not previously kept animals at home and do not have antibodies to toxoplasmosis. You can get infected when cleaning the cat’s toilet, because the pathogens are contained in the feces, if the pregnant woman is protected from this process, it will prevent infection. 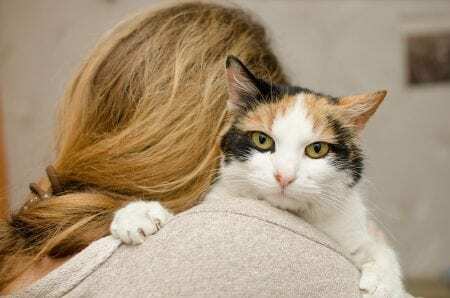 If the cat has lived with you earlier, for many years, it is not worth it because of the risk of getting toxoplasmosis from giving the animal – it is not dangerous for you. To eliminate the experience in this regard, for prevention, take your cat to a veterinarian, he will give you an exact answer regarding toxoplasmosis, and besides, it will help to avoid also infection from the cat with worms. A common disease, which is typical mainly for street cats, is ringworm. It is contagious for humans, has a fungal nature, with it affected smooth skin and hair. On the body of a cat and a human fungus actively multiplies, giving special ring lesions, inside which the hair breaks off, as if cut by a typewriter – hence the name of the disease. Children are more often infected with this disease, picking it up from homeless kittens. At the same time, the smooth skin and hair on the head, back, chest, hands or feet suffer. Promotes the spread depriving the reduction of immune defense, both local and general, which is typical in pregnancy, in debilitated people and in old age. Fortunately, the skin and hair are very amenable to treatment – they are treated with special ointments and shampoos, solutions. Hair then grow well. Scratch, bite the cat: are they dangerous? Most often from cats people get just minor injuries – it’s biting or scratching with claws, if it’s playing with a cat or trying to hurt her, disturb her peace. 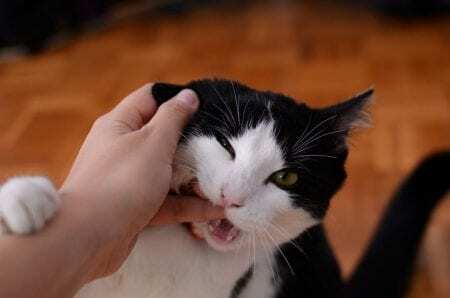 About bites of cats, there are fewer calls to doctors, but scratches can sometimes be quite deep and dangerous, especially in children and in the area of ​​tender skin of the face, neck, and groin. A cat’s bite, if this is a stray and aggressive animal, can be dangerous in terms of infestation by rabies, and pets with bites osljanyut wound, which then can heal for a long time. In the mouth of the cat are many pathogenic microbes that fall into the wound, it can threaten suppuration. Scratches of cats are dangerous in terms of the development of a particular pathology – felinosis or “cat scratch disease”. But its symptoms are often not associated with games with animals and therefore do not cure for a long time. If you decide to have a cat – do not worry about the possible diseases that it can reward you. If you take an animal from a nursery or from pets, this is already a hazard prevention. Usually kittens and even more so, that thoroughbreds undergo the necessary preventive measures from a veterinarian, receive vaccinations and anthelmintic therapy. If it is a kitten picked up in the street or an adult animal, prevention of danger is an immediate trip to the vet. The doctor will examine the cat and determine its presence (absence) of diseases, tell you how to treat it, and will take all necessary measures to protect you from possible problems. In addition, the doctor can also give advice on the clipping, nourishment and care that will make your life with the pet safe and pleasant. Previous PostPrevious Why Do I Constantly Feel Thirsty During Sleep? How to make friends a cat and a dog?